The lowest-mortality BMI: What is its relationship with fat-free mass? Do overweight folks live longer? It is not uncommon to see graphs like the one below, from the Med Journal Watch blog (), suggesting that, at least as far as body mass index (BMI) is concerned (), overweight folks (25 < BMI < 30) seem to live longer. The graph shows BMI measured at a certain age, and risk of death within a certain time period (e.g., 20 years) following the measurement. The lowest-mortality BMI is about 26, which is in the overweight area of the BMI chart. Note that relative age-adjusted mortality risk (i.e., relative to the mortality risk of people in the same age group), increases less steeply in response to weight variations as one becomes older. An older person increases the risk of dying to a lesser extent by weighing more or less than does a younger person. This seems to be particularly true for weight gain (as opposed to weight loss). 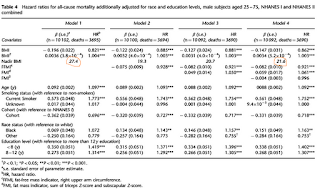 The table below is from a widely cited 2002 article by Allison and colleagues (), where they describe a study of 10,169 males aged 25-75. Almost all of the participants, ninety-eight percent, were followed up for many years after measurement; a total of 3,722 deaths were recorded. Take a look at the two numbers circled in red. The one on the left is the lowest-mortality BMI not adjusting for fat mass or fat-free mass: a reasonably high 27.4. The one on the right is the lowest-mortality BMI adjusting for fat mass and fat-free mass: a much lower 21.6. Then we have an interesting 2003 article by Bigaard and colleagues () reporting on a study of 27,178 men and 29,875 women born in Denmark, 50 to 64 years of age. 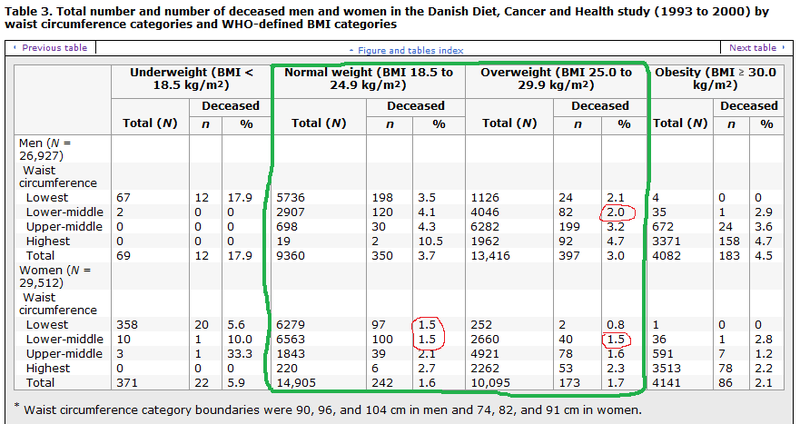 The table below summarizes deaths in this study, grouping them by BMI and waist circumference. These are raw numbers; no complex statistics here. Circled in green is the area with samples that appear to be large enough to avoid “funny” results. 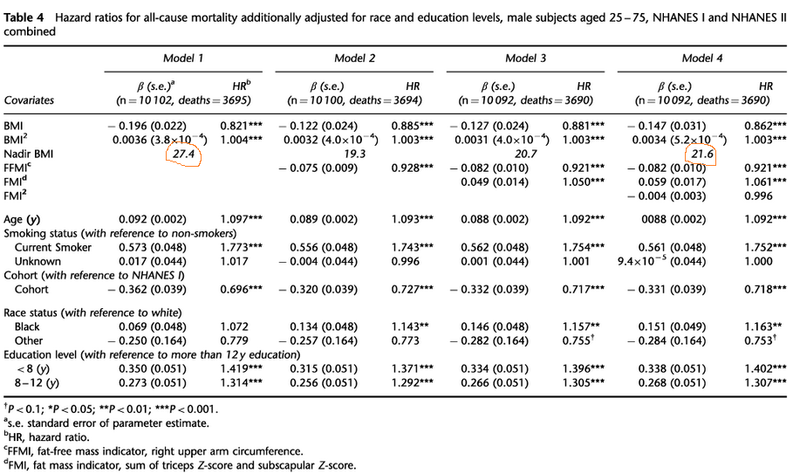 Circled in red are the lowest-mortality percentages; I left out the 0.8 percentage because it is based on a very small sample. 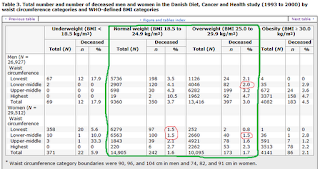 As you can see, they refer to men and women with BMIs in the 25-29.9 range (overweight), but with waist circumferences in the lower-middle range: 90-96 cm for men and 74-82 cm for women; or approximately 35-38 inches for men and 29-32 inches for women. 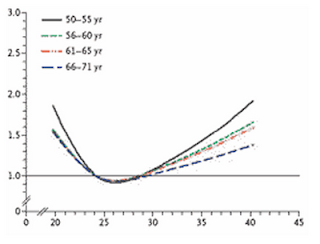 Women with BMIs in the 18.5-24.9 range (normal) and the same or lower waists also died in small numbers. Underweight men and women had the highest mortality percentages. A relatively small waist (not a wasp waist), together with a normal or high BMI, is an indication of more fat-free mass, which is retained together with some body fat. It is also an indication of less visceral body fat accumulation. One of the problems often pointed out about rice, and particularly about white rice, is that its nutrition content is fairly low. It is basically carbohydrates with some trace amounts of protein. A 100-g portion of cooked white rice will typically deliver 28 g of carbohydrates, with zero fiber, and 3 g of protein. The micronutrient content of such a portion leaves a lot to be desired when compared with fruits and vegetables, as you can see below (from Nutritiondata.com). Keep in mind that this is for 100 g of “enriched” white rice; the nutrients you see there, such as manganese, are added. White rice is rice that has had its husk, bran, and germ removed. This prevents spoilage and thus significantly increases its shelf life. As it happens, it also significantly reduces both its nutrition and toxin content. White rice is one of the refined foods with the lowest toxin content. Another interesting property of white rice is that it absorbs moisture to the tune of about 2.5 times its weight. That is, a 100-g portion of dry white rice will lead to a 250-g portion of edible white rice after cooking. This does not only dramatically decrease white rice’s glycemic load () compared with wheat-based products in general (with some exceptions, such as pasta), but also allows for white rice to be made into a highly nutritious dish. If you slow cook almost anything in water, many of its nutrients will seep into the water. All you have to do is to then use that water (often called broth) to cook white rice in it, and you will end up with highly nutritious rice. Typically you will need twice as much broth as rice, cooked for about 15 minutes – e.g., 2 cups of broth for 1 cup of rice. You can add meats to the white rice, such as pulled chicken or shrimp; add some tomato sauce to that and you’ll make it a chicken or shrimp risotto. 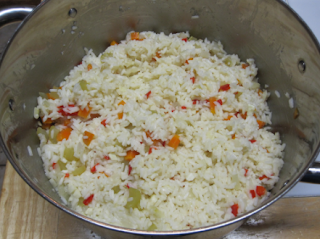 You can also add vegetables to the rice. If you want your rice to have something like an al dente consistency, I recommend doing these after the rice is ready; i.e., after you cooked it in the broth. For the white rice-based dish below I used a broth from about two hours of slow cooking of diced vegetables; namely red bell peppers, carrots, celery, onions, and cabbage. After cooking the rice for 15 minutes, and letting it "sit" for a while (another 15 minutes with the pan covered), I also added the vegetables to it. As a side note, the cabbage and onion tend to completely dissolve after 1 h or so of slow cooking. The added vegetables give the dish quite a nutritional punch. For example, the cabbage alone seems to be a great source of vitamin C (which is not completely destroyed by the slow cooking), the anti-inflammatory amino acid glutamine, and the DNA repair-promoting substance known as indole-3-carbinol (). The good folks over at the Highbrow Paleo group on Facebook () had a few other great ideas posted in response to my previous post on the low glycemic load of white rice (), such as cooking white rice in bone broth (thanks Derrick! ).